Free Printable Graduation Day Poem. 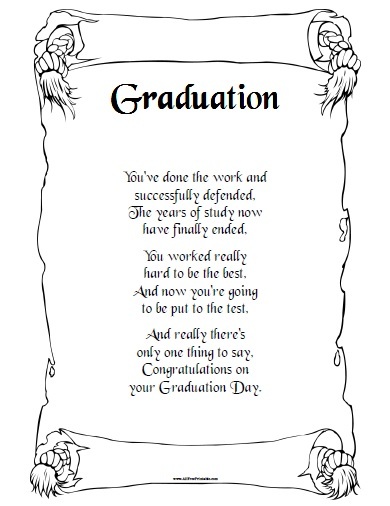 Free Printable Poem for Graduation Day. You can use this poem to read to all graduates as part of the program or simply dedicate it to a specific graduate, student, or friend. You can print it using your inkjet or laser printer and share with guests at Graduation Day. Great printable that you can use at home, school, church, classroom, university, homeschooling or for Graduation Day. Is a great idea for every graduation day. The Graduation Day Poem includes a beautiful graduation scroll border frame. Click the link below to download or print the free Graduation Day Poem now in PDF format.